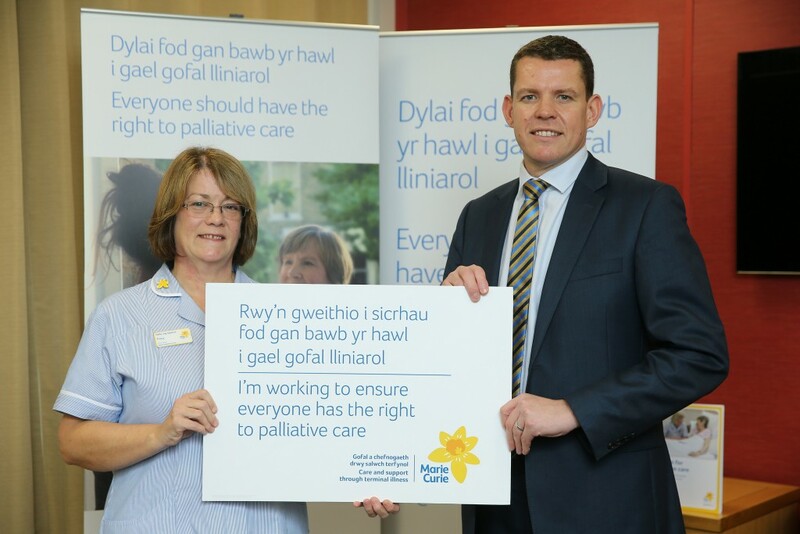 Ynys Môn AM Rhun ap Iorwerth has pledged to champion the concerns of local people with a terminal illness by lending his support to a Marie Curie campaign calling for the right for everyone to have palliative care when they need it. Rhun ap Iorwerth AM teamed up with Marie Curie Senior Health Care Assistant Tracy Tucker at Tŷ Hywel in Cardiff Bay on Tuesday 17th November to back the campaign from the UK’s leading charity supporting people living with any terminal illness, and their families. The campaign comes as Marie Curie revealed that only half of people over the age of 50 in the Wales – of whom there are 1.2 million – are not confident that they will get the care they need towards the end of their life. Currently, one in four people each year who need palliative care miss out on it because their needs are not recognised and they are not referred on to the right services. Marie Curie is calling on the Welsh Government to build on the good work already done to improve access to high quality palliative and end of life care for everyone with a terminal illness. Rhun ap Iorwerth has pledged to help ensure that any constituents who have a terminal illness know what services and benefits they are entitled to; and work with local NHS services to improve access to and quality of palliative care for those who need it. In Anglesey Marie Curie has around 15 nurses operating one service to ensure that people living with a terminal illness get the care and support they need. Typically, Marie Curie Nurses provide overnight care between 10pm and 7am. If you or someone you’re close to has a terminal illness, you can call the Marie Curie Support Line on 0800 090 2309 Monday to Friday, 9am to 5pm or visit mariecurie.org.uk/help. You can also share experiences and talk to people in a similar situation on the Marie Curie community .